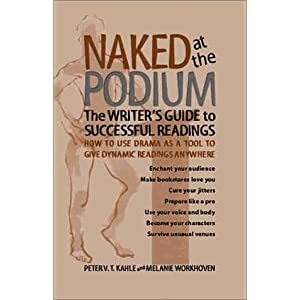 Talk about niche markets: Naked at the Podium is a book about how to read your work at author events. This is a self-published book from (way) before self-publishing was cool. I got my copy from a used book website. My verdict on Naked at the Podium is: hokey, but ultimately useful. Some of the advice in this book I will simply never take. I cannot, for example, picture myself doing yoga stretches "backstage" at a bookstore. No matter how much better they might make me feel, one wonders which bookstores the authors had in mind when they thought I might find a sufficiently private location to do the "side stretch" or the "doll flop" without making a spectacle. Chapter Six: (Stage Presence) is very useful. One thing this book does very well is to help the reader understand her true role. Since the book is co-written by a writer and a professional actor, the text is very clear that at your reading, you are a performer. For those eight or fifteen minutes you're reading, and for the half hour you're speaking and answering questions, it's your show. There is some clear advice about how to "take the stage," and what your audience expects from you. The information is probably the same that you'd get on Day #1 at acting school, but with only a dozen days left until I too am (metaphorically!) Naked at the Podium, I was ready to hear it. I'm a professional actor with years of training, so this is the part that doesn't scare me. Feel free to email me if I can be of any use to you, Sarah. It may comfort you to know that even the pros get nervous before going before a live audience. I mean, very nervous. It's okay. Just know that and accept it. Once you're out there and you start, the jitters will melt away and you'll be fab! Oh gosh I'm about to be naked up there too! My debut novel is out in April and I have no skills whatsoever beyond writing! Help!